You'll be £19.99 closer to your next £10.00 credit when you purchase Fight Another Day. What's this? 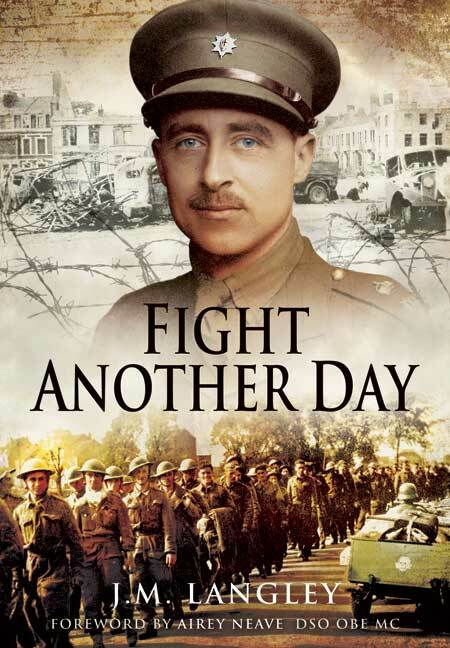 Fight Another Day is a classic Second World War prisoner-of-war 'home-run' escape story by the man who went on to lead M19, who organised the POW escape chains from Nazi occupied Europe. As a young subaltern in the Coldstream Guards, Jimmy Langley lost his arm at Dunkirk and was captured but eventually escaped via Lille, Paris, Marseilles, Spain and Gibraltar. He describes the fierce fighting outside Dunkirk, his captivity, escape and extraordinary life in Vichy France, before the Germans controlled it. His fellow escapees and the French who sheltered them make a rich cast of characters. courage and sacrifice of the heroic underground operators who ran these escape lines through Nazi-occupied Belgium and France. Despite betrayal and infiltration from Germans, collaborators and traitors, over 3,000 men were safely brought back to 'fight another day'. Langley was joined by Airey Neave after his historic home run from Colditz, and together they had to wrestle with rival secret organisations for resources to carry out their vital work. Readers gain a fascinating insider-view of the wartime secret service. All this and more is brilliantly described in this gripping, beautifully written book. As seen in the Folkestone Herald. the exciting tale of the author, James Langley, an officer in the Coldstream Guards who was captured in 1940 by the Germans at Dunkirk after losing one of his arms. This memoir begins with Jimmy Langley joining the Coldstream Guards as a Lieutenant and taking part in the fighting around Dunkirk whilst the British Expeditionary Force was being evacuated. Wounded and taken prisoner, Langley's left arm was amputated, but this did not deter him from escaping, or rather making an "unauthorised departure" as he preferred to term it, as his method of simply climbing out of his hospital window during the night was at odds with the perils of a conventional escape. His subsequent adventures on his way to Gibraltar via Vichy France and Spain were much more remarkable, and if his story was to end when he returned home then this would have been a perfectly sufficient memoir in itself. Yet Langley joined and eventually became the commanding officer of MI9, whose brief was to give every assistance to escaping prisoners of war. He describes the escape routes which were established across Western Europe, and the tremendous work done by the resistance forces who manned them and returned in excess of 3,000 servicemen to the Allied lines. A classic Second World War prisoner-of-war 'home run' escape story by the man who led M19, and who organised the POW escape chains from Nazi occupied Europe. In Fight Another Day both Langley and Neave return to old wounds to publicly settle accounts with MI6. The story of MI9 becomes a stick with which to further beat the record of MI6. Given Neave’s political prominence in the 1970s, and later conspiracy theories about his murder, the criticisms of MI6 contained in Fight Another Day are interesting on more than one level. Criticism of MI6 was significantly more muted in Darling’s 1977 book and in the collaboration between Foot and Langley. Fight Another Day therefore represents a particularly significant text in terms of wartime British intelligence and the process of revealing that past in the 1970s. Pen and Sword are to be congratulated in reprinting this previously hard to purchase text. This book carries a foreword by the Late Airey Neave MP who was murdered by an IRA bomber. Appropriately, the same publisher has reprinted, in a new format, the book by Airey Neave that was originally published in the early 1950s. The two men served together after escaping German prisons, having been captured during the closing stages of the Battle of France. Together they combined their experiences to help evaders and escapers to exfiltrate from Occupied Europe as members of MI9. Langley was head MI9. The two books complement each other and expand the combined story. Neave was wounded at Calais and ended up in the ‘escape proof’ Colditz Castle, where he was to make the first successful ‘home run’ escaping via Switzerland. Langley lost an arm at Dunkirk, was captured, but eventually made his escape Lille, Paris, Marseilles, Spain and Gibraltar. James Maydon (Jimmy) Langley was born in 1916 and graduated from Cambridge before joining the Coldstream Guards. Post-war he worked for Fisons and then ran the Deben Bookshop at Woodbridge and the Ancient House Bookshop, Ipswich.